The INDCs have the capability of limiting the forecast temperature rise to around 2.7C by 2100, by no means enough but a lot lower than the estimated four, five, or more degrees of warming projected by many prior to the INDCs. In the context of the objective of limiting prospective global warming to 2C this statement gives encouraging news. Already the policy proposals are most of the way towards that objective, so a final push at COP21 in Paris is all that is required. The analysis by the UNFCCC shows that the policy proposals contained within the INDCs will make very little difference to trends in global emissions of greenhouse gases to 2030. In the accompanying literature, the UNFCCC makes no projections of the difference the INDCs will make beyond 2030. The claim that policy will limit forecast temperature rise to the 2.7C by 2100 is claimed by two other organisations, and is only referenced in a table at the very end of a separate technical annex without any discussion or endorsement. One of these, the IEA, achieves the projection by, post 2050, replacing forecasts contingent on the policy impact of the INDCs with an average of modelled RCP emissions pathways. The RCP website explicitly states that they are not forecasts of potential emissions or climate change, whether with or without policy action. It also states that any of the differences between the pathways be directly attributed to policy differences. The IEA thus replaces real emissions forecasts with data that is unrelated to the real world. The other claim, by Climate Action Tracker, has no explicit statement of how the increasing global emissions through to 2030 start tracking downwards post 2030. Contributing factors may include understating the emissions impact of India and China, along with excluding the likely increasing emissions in the coming decades from the poorest nations. The claim that any agreement reached in Paris based on the INDCs will constrain to global average temperature rise to 2.7C by 2100 through constraining GHG emissions is therefore unsupported by any rigorous forecast of the policy impact in the referenced documents. Such forecasts are based on making a forecast without policy, then modelling the impact policy will make, stating the assumptions. With 40,000 people attending a conference, the UNFCCC could surely have set aside a couple of million dollars to obtain such a forecast from genuine experts. All climate policies by the US, China, the EU and the rest of the world, implemented from the early 2000s to 2030 and sustained through the century will likely reduce global temperature rise about 0.17°C in 2100. These impact estimates are robust to different calibrations of climate sensitivity, carbon cycling and different climate scenarios. Current climate policy promises will do little to stabilize the climate and their impact will be undetectable for many decades. Having read the policy proposals on a large number of INDCs I concur with Lomborg. There is very little in the INDCs that will alter the future course of warming. So why the difference between my reading and the UNFCCC? The Executive Secretary has the World’s leading experts behind her, so there must be substantial support for the claim. The BBC article provides a link to the UNFCCC Synthesis report on the aggregate effect of INDCs. The link is to a number of documents. The main document makes no attempt to project forward the policy impacts to 2100. In fact if it did, the prognosis would be similar to Lomborg’s. The main graphic in Figure 2, also as a separate file, is shown below. The orange is the pre-INDC pledges, the yellow the INDCs and the blues various scenarios to stay below two degrees. To the right is two graphics for 2025 and 2030. The yellow arrow is “Reduction due to INDCs” and the blue arrow “Remaining reduction for least-cost mitigation“. For 2030 the INDCs seem to get a quarter of the way to the desired reduction. There is nothing about trends beyond 2030. The graphic could not be clearer. If the INDCs are to obtain constrain emissions consistent to the 2C of warming, the increasing trend from 2010 to 2030 would have to be rapidly turned into a decreasing trend post 2030, with global emissions reduced by half in two decades. As the non-policy trend is for about 4.5C of warming, then to obtain a 2.7C forecast requires the INDCs to collectively cause emissions to peak and then start a downward trend. It is clear that there is no mention at all of the 2.7C of warming by 2100. No bridge of the 70 years from the period covered by the INDCs to the end of the century. What is more there is nothing in the aggregate policy contained in INDCs that would cause global emissions to first peak, then be set on a downward trend. So where is the reference? For that you need to look in the Technical Annex section M. Summary of results from other studies. Even then the text does not mention 2100, but table 6 does. Instead of the UNFCCC making projections to 2100 on the basis of the INDCs for themselves, they use those of others. Yet the UNFCCC should have the expertise in projecting the impact of policy. I will look at three – that of another UN organisation and the two estimating 2.7C resulting from the INDCs. Full implementation of unconditional INDC results in emission level estimates in 2030 that are most consistent with scenarios that limit global average temperature increase to below 3.5 °C until 2100 with a greater than 66 per cent chance. There is no actual projection from the INDCs. Rather, it looks at the emissions levels and emission trends in 2030 and compares them with modelled estimates that are similar. It is these modelled estimates that produce the 3.5C of warming in 2100. There is no reconciliation between the country-by-country INDCs and the overall global emissions scenarios. Rather it is just picking estimates that seem to fit at a global level. In terms of assessing the impacts of policy it is useless, as the modelled estimates may be markedly different from a forecast based on the latest information. To assess the impact on global average temperature increase, we used MAGICC with an emissions pathway post-2050 in between the representative concentration pathways (RCP) 4.5 and (RCP) 6 scenarios from the IPCC’s Fifth Assessment Report as this was interpreted as representing the best available trajectory compatible with IEA’s INDC Scenario. RCP 4.5: … is a stabilization scenario where total radiative forcing is stabilized before 2100 by employment of a range of technologies and strategies for reducing greenhouse gas emissions. RCP 6.0: … is a stabilization scenario where total radiative forcing is stabilized after 2100 without overshoot by employment of a range of technologies and strategies for reducing greenhouse gas emissions. The RCPs are named according to their 2100 radiative forcing level as reported by the individual modeling teams. ……. The RCPs are not forecasts or boundaries for potential emissions, land-use, or climate change. They are also not policy prescriptive in that they were chosen for scientific purposes to represent the span of the radiative forcing literature at the time of their selection and thus facilitate the mapping of a broad climate space. They therefore do not represent specific futures with respect to climate policy action (or no action) or technological, economic, or political viability of specific future pathways or climates. ….. The RCPs are four independent pathways developed by four individual modeling groups. The socioeconomics underlying each RCP are not unique; and, the RCPs are not a set or representative of the range of potential assumptions. …. The differences between the RCPs can therefore not directly be interpreted as a result of climate policy or particular socioeconomic developments. Any differences can be attributed in part to differences between models and scenario assumptions (scientific, economic, and technological). The IEA has therefore used a hybrid of emissions scenarios as emissions forecasts to assess the impact policy when the group producing them has specifically said that these scenarios are not directly comparable and should not be used for policy purposes. In so doing, they implicitly make a set of assumptions about policy that may not relate to the real world and are definitely not related to the policies proposed within the INDCs. CAT tracks the INDCs from 32 nations that currently have about 80% of global emissions. Their estimate of the INDC impact until 2030 is broadly consistent with the UNFCCC. However, I am not sure where they obtain the historical emissions figures. For countries they appear to be from the World Resources Institute CAIT2.0. CAIT2.0 figures which are slightly different from those in the UNFCCC Country Briefs, but not markedly so in total. CAT’s methodology does have the advantage of providing a breakdown by country until 2030 between the BAU, but beyond 2030 details are distinctly hazy. The 2.7C claim is made on a briefing of 1st October 2015. The main graph behind the 2.7C estimate is reproduced below. India – The INDC that estimates a tripling of emissions between 2014 and 2030 was not available when the briefing was published, which only assumes a doubling. The country assessment for India then tries to reconcile the difference by some fancy assumptions (lower economic growth rates and a higher emissions intensity reduction than in the INDC), without adjusting the overall assessment. If CAT’s 5GtCO2e estimate of 2030 emissions turns out to be correct (9% of global emissions), it will only be emissions growth delayed not a lower emissions peak. It is unlikely that India’s emissions will peak at less than 10GtCO2e, equivalent to over 20% of 2010 global emissions. China – will likely reach peak emissions prior to 2030, but that peak will be likely higher than the 13.6GtCO2e forecast The CAT country assessment admits this is the case, but makes no allowance in the emissions forecast. Missing Countries – Most of Africa, along with Pakistan, Vietnam, Bangladesh, Thailand and Myanmar are missing from the sample. Collectively their current emissions are small, but in the coming decades the share will rise. Africa’s emissions will rise as most of the global population increase in the latter half of the century is forecast to be within the continent. In South Asia there is already economic growth above the world average that will likely continue as the poorer countries follow in the wake of India. By 2100 these countries could collectively have emissions greater than current emissions of the OECD and China combined. Ambiguities in the INDCs – Many of the INDCs are highly ambiguous. The historical figures are inconsistent; the forecasts are opaque; some key figures are missing; and it is not clear if some pledges in the INDC are in addition to the others, or part of the whole. CAT maximises the impact, rather than trying to frame questions for the submitting countries to clarify. There should be an assessment of these pledge risk factors. These will likely reduce the estimated policy impact. Without any other hidden assumptions, CAT’s methods are likely to massively overstate the impact of policy. Critically is how increasing global emissions though to 2030 become decreasing global emissions post 2030. As inferred above, I believe it is due to systematic understating emission projections in the sample countries and ignoring the growth in the other countries. It may also be due to making further policy assumptions for the period beyond 2030. We will only be able to assess the impact if CAT provide a full country-by country projections of emissions in 2100 for the sample countries for both BAU and with INDC scenarios, along with projections for the rest of the world. Putting the figures on a table, rather than spending time creating graphs from which figures have to be estimated, would ease the process. If proper forecasts have been generated (that is making a forecast without policy, then modelling the impact policy will make) then the outline figures will be available already. The UNFCCC presents no evidence that policy contained within the INDC submissions will make more than a small difference to global emissions in 2100. Instead they rely on external organisations. One quite clearly substitutes real world forecasts with emissions scenarios that do not relate to real world situations, and assume implementation of policy quite different to that contained with the INDCs. The other is likely to have massively overstated the policy impacts, but a lack of any clear statements as to how the conclusions were arrived at means quantification is not possible. The claims that the policy pledges within the INDCs will massively alter global emissions levels in the latter part of this century (and, subject to the climate models being broadly correct, the rise in global average temperatures) are without any proper foundation. The UNFCCC Executive Secretary Christiana Figueres is has made a misleading statement to drive through policies that are both costly and ineffective. Such forecasts are based on making a forecast without policy, then modelling the impact policy will make, stating the assumptions. With 40,000 people attending a conference, the UNFCCC could surely have set aside a couple of million dollars to obtain a rigorous forecast from leading experts in that field. The methodology is fairly straightforward. It requires making a forecast for each country without policy, then modelling the impact policy will make, stating the assumptions. The important parts are data gathering, adhering rigorously to a consistent method and leaving an audit trail. The following is a comment to be posted at Bishop Hill, responding to another attempt by blogger ….andThenThere’sPhysics to undermine the work of Bjorn Lomborg. The previous attempt was discussed here. This post includes a number of links, as well as a couple of illustrative screen captures at the foot of the table. In fact, you should read Joe Romm’s post about this. He’s showing that the INDCs are likely to lead to around 3.5C which I think is relative to something like the 1860-1880 mean. This is very similar to the MIT’s 3.7, and quite a bit lower than the RCP8.5 of around 4.5C. So, yes, we all know that the INDCs are not going to do as much as some might like, but the impact is likely to be a good deal greater than that implied by Lomborg who has essentially assumed that we get to 2030 and then simply give up. aTTP at 9.31 refers to Joe Romm’s blog post of Nov 3 “Misleading U.N. Report Confuses Media On Paris Climate Talks“. Romm uses Climate Interactive’s Climate Scoreboard Tool to show the INDC submissions (if fully implemented) will result in 3.5°C as against the 4.5°C in the non-policy “No Action” Scenario. This is six times the claimed maximum impact of 0.17°C claimed in Lomberg’s new paper. Who is right? What struck me first was that Romm’s first graph, copied straight from the Climate Interactive’s seem to have a very large estimate for emissions in the “No Action” Scenario producing. Downloading the underlying data, I find the “No Action” global emissions in 2100 are 139.3 GtCO2e, compared with about 110 GtCO2e in Figure SPM5(a) of the AR5 Synthesis Report for the RCP8.5 scenario high emissions scenario. But it is the breakdown per country or region that matters. For the USA, without action emissions are forecast to rise from 2010 to 2030 by 40%, in contrast to a rise of just 9% in the period 1990 to 2010. It is likely that emissions will fall without policy and will be no higher in 2100 than in 2010. 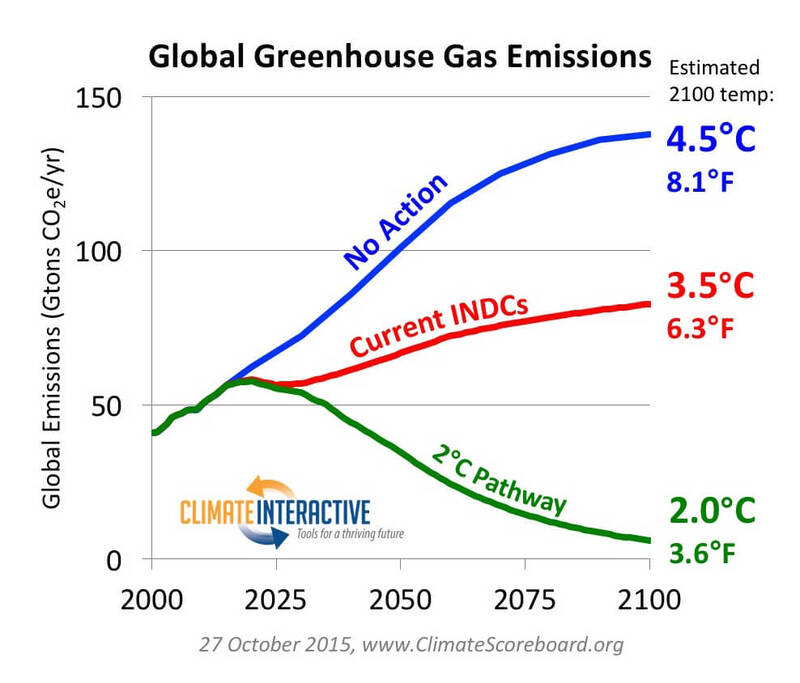 The “no action” scenario overestimates 2030 emissions by 2-3 GtCO2e in 2030 and about 7-8 GtCO2e in 2100. For the China the overestimation is even greater. Emissions will peak during the next decade as China fully industrializes, just as emissions peaked in most European countries in the 1970s and 1980s. Climate Interactive assumes that emissions will peak at 43 GtCO2e in 2090, whereas other estimates that the emissions peak will be around 16-17 GtCO2e before 2030. Together, overestimations of the US and China’s “No Action” scenarios account for over half 55-60 GtCO2e 2100 emissions difference between the “No Action” and “Current INDC” scenarios. A very old IT term applies here – GIGO. If aTTP had actually checked the underlying assumptions he would realise that Romm’s rebuttal of Lomborg based on China’s emission assumptions (and repeated on his own blog) are as false as claiming that the availability of free condoms is why population peaks. Figure 1: Climate Interactive’s graph, referenced by Joe Romm. Figure 2: Reproduction of Figure SPM5(a) from Page 9 of the AR5 Synthesis Report. This article investigates the temperature reduction impact of major climate policy proposals implemented by 2030, using the standard MAGICC climate model. Even optimistically assuming that promised emission cuts are maintained throughout the century, the impacts are generally small. ………… All climate policies by the US, China, the EU and the rest of the world, implemented from the early 2000s to 2030 and sustained through the century will likely reduce global temperature rise about 0.17°C in 2100. These impact estimates are robust to different calibrations of climate sensitivity, carbon cycling and different climate scenarios. Current climate policy promises will do little to stabilize the climate and their impact will be undetectable for many decades. That is pretty clear. COP21 in Paris is a waste of time. An alternative estimate is provided in a paper by Boyd, Turner and Ward (BTW) of the LSE Grantham Institute, published at the end of October. The MAGICC climate model used by both Lomborg & the IPCC predicts warming of about 4.7°C under BAU, implying up to a 1.35°C difference from the INDCs, compared to the 0.17°C maximum calculated by Lomborg, 8 times the amount. Lomborg says this is contingent on no carbon leakage (exporting industry from policy to non-policy countries), whilst citing studies showing that it could offset 10-40%, or even over 100% of the emissions reduction. So the difference between sceptic Lomborg and the mighty LSE Grantham Institute is even greater than 8 times. Yet Lomborg refers extensively to the August Edition of BTW. So why the difference? There is no explicit indication in BTW of how they arrive at their halfway conclusion. nor a comparison by Lomborg. Two other estimates are from the UNFCCC, and Climate Action Tracker. Both estimate the INDCs will constrain warming to 2.7°C, or about 2.0°C below the MAGICC BAU scenario. They both make assumptions about massive reductions in emissions post 2030 that are not in the INDCs. But at least the UNFCCC and CAT have graphs that show the projection through to 2100. Not so with BTW. This is where the eminent brain surgeons and Nobel-Prize winning rocket scientists among the readership will need to concentrate to achieve the penetrating analytical powers of a lesser climate scientist. From the text of BTW, the hypothetical business as usual (BAU) scenario for 2030 is 68 GtCO2e. The most optimistic scenario for emissions from the INDCs (and pessimistic for economic growth in the emerging economies) us that 2030 emissions will be 52 GtCO2e. The sophisticated climate projection models have whispered in code to the climate scientists that to be on target for the limit of 2.0°C, 2030 emissions show be not more than 36 GtCO2e. The mathematicians will be able to determine that 52 is exactly halfway between 36 and 68. Now for the really difficult bit. I have just spent the last half hour in the shed manically cranking the handle of my patent beancounter extrapolator machine to get this result. By extrapolating this halfway result for the forecast period 2010-2030 through to 2100 my extrapolator tells me the INDCs are halfway to reaching the 2.0°C maximum warming target. As Bob Ward will no doubt point out in his forthcoming rebuttal of Bjorn Lomborg’s paper, it is only true climate scientists who can reach such levels of analysis and understanding. I accept no liability for any injuries caused, whether physical or psychological, by people foolishly trying to replicate this advanced result. Please leave this to the experts. But there is a serious side to this policy advocacy. The Grantham Institute, along with others, is utterly misrepresenting the effectiveness of policy to virtually every government on the planet. Lomborg shows by rigorous means that policy is ineffective even if loads of ridiculous assumptions are made, whether on climate science forecasting, policy theory, technological solutions, government priorities, or the ability of current governments to make policy commitments for governments for decades ahead. My prediction is that the reaction of the Grantham Institute, along with plenty of others, is a thuggish denunciation of Lomborg. What they will not consider is the rational response to wide differences of interpretation. That is to compare and contrast the arguments and the assumptions made, both explicit and implicit. In looking at the Indonesian INDC submission, I came across a confusing array of estimates for Indonesia’s total greenhouse gas emissions. These are the ones I found. The Indonesian INDC Submission says it will give unconditionally cut emissions by 29% from the BAU of 2881 MtCO2e, it means that in 2030 emissions will be about 100 MtCO2e lower than in 2005 not 1120 MtCO2e lower (UNFCCC) or 530 MtCO2e higher (EDGAR) . But on the basis of the UNFCCC or EGDAR figures by 2010 Indonesia had fallen by a third, so meeting the 2030 unconditional target should prove a doddle. Alternatively, use the World Resources Institute CAIT 2.0 data and Indonesia has unconditionally agreed something much more drastic. Between 2005 and 2010 emissions grow at 4% a year. On that trend, the 2030 BAU becomes 4200 MtCO2e, not 2881 MtCO2e, so the unconditional emissions “cut” is not 29% but 51%. The worst example is contained in a graph about the Indonesian INDC Submission at the World Resources Institute Blog and reproduced below. Scale is in KtCO2e, not MtCO2e. Nor does is there any trace of Indonesia’s claimed emissions 1800 Mt CO2e in 2005. So where does this wibbly-wobbly projection come from? The reference includes BAPPENAS 2015 – the Indonesian “National Development Planning Agency”. A search finds this graph. The figure for 2005 is about 1400 MtCO2e, not the 1800 MtCO2e stated in the INDC. The Indonesian’s have fiddled their own unaudited figures to get a politically desired result – an easily achievable “reduction” in GHG emissions. Even worse, the WRI does check the data. There are minor points that the Indonesian “dalam ribu ton” translates on Google as “in thousand tons“, or that anyone who knows climate data would realize that 1,000,000 MtCO2e is greater than 49GtCO2e, the UNIPCCs AR5 global estimate of GHG emissions in 2010. Finally, the Carbon Brief, in a recent article says that 1997 was a record for forest fires – a record that may be broken in 2015. Already 1600 MtCO2e has been emitted from forest fires. On this basis, therefore, 1997 total Indonesian emissions are likely to be well in excess of 2000 MtCO2e, and a considerable spike in the record. In summary, emissions figures for Indonesia are just arbitrary estimates, based on extremely limited and contradictory data. Both the WRI and the Indonesian Government cherry-pick data to suit their cause. Whether it is justified depends on the purpose. The WRI states their missions clearly. That is to impose their environmentalist beliefs and perspectives on everybody else. This is, in my view, a far more rounded and focused mission. Against the environmentalist ideologies of the UNFCCC I believed that in manipulating figures Indonesia is serving the interests of 250 million Indonesians.